Mark Pritchard is an author and practitioner of esoteric knowledge. He writes with his spiritual name Belsebuub, which is the name of Mark’s spirit/soul/consciousness. Everyone has their own unique spiritual name. Mark is the author of a number of books on out-of-body experiences, dreams, self-knowledge, and spiritual transformation including A Course in Astral Travel and Dreams, which became a bestseller in its genre, and Gazing into the Eternal, which was a finalist for the Best Book Awards 2009 in the spirituality category. He has appeared on over 70 radio and television programs internationally and writes from decades of spiritual practice and experiences. You can find a curated collection of these interviews on Belsebuub’s Media Interviews YouTube Channel. Belsebuub’s work describes a spiritual path that ultimately leads to the return to source consciousness, a process described as immortality, salvation, enlightenment, or liberation in a number of ancient sacred texts. This path can also be found imbued in the very fabric of creation, reflected in the yearly cycle of the sun through the solstices and equinoxes. Belsebuub’s writings explore how this solar cycle depicts the process of enlightenment and return to the divine source of creation. He states that this spiritual process was once the foundation for a religion of the sun, which spanned the globe in pre-historic times and left behind an incredible legacy of megalithic monuments, pyramids, cairns, and other sacred sites. In the Path of the Spiritual Sun, co-written with his wife Lara, Belsebuub explains that many ancient sites are in fact much older than is accepted by mainstream archaeology, and that the many precise alignments to the solstices and equinoxes in sites found around the world were a method used by the ancients to encode spiritual teachings. This method helped ensure these teachings would pass the test of time, even across thousands of years. Belsebuub and Lara’s groundbreaking ongoing work involves uncovering and piecing together the evidence for this ancient spiritual teaching and interpreting it for the modern era using the knowledge Belsebuub has gained while walking the path to enlightenment. Belsebuub writes about the process of spiritual transformation from his own experience of going through it over the last 26 years. He began this process himself in 1991 after he first learnt its key exercises. You can read more about who Belsebuub is, including learning about his personal spiritual journey in more depth on his biography site www.belsebuubbiography.com, or go straight to the summarized Wikipedia-style version here. From his experience of the spiritual path, Belsebuub is able to write very precisely about each stage of the process leading to enlightenment and what someone needs to do to experience it themselves. This information has been given many times in the past by spiritual figures throughout history, but has been repeatedly suppressed, persecuted, destroyed, and obscured. Today, Belsebuub describes it in a complete form that is understandable in contemporary terms, so that anyone who is interested can begin this process too. Belsebuub giving a talk at a retreat in 2008. By tapping into his experience of the esoteric side of life – a source of knowledge that mystics throughout time have been able to access – Belsebuub’s work is also able to shed light on many formerly incomprehensible ancient texts, sites, and symbols that expressed this process. Furthermore, he provides techniques to explore spiritual and scientific phenomena such as out-of-body experiences, psychic faculties, dreams, the possibility of life after death, and much more. Belsebuub provides his work in accordance with the principle that spirituality is a gift given freely from the universe, which should be shared with others in the same way. For this reason, he has never charged for his work, instead aiming to provide information about spiritual transformation that is freely available to anyone interested in it. After beginning his spiritual journey in the 90s, Belsebuub spent a decade teaching thousands of people at no cost in cities across the UK and Australia. In 2001 he began authoring a series of free online courses on astral travel, self-discovery, and esoteric knowledge that became the most popular of their kind. Over 90,000 people registered for his courses. Belsebuub continues to work by this same principle today; all the work on Belsebuub.com is provided free of charge, except for printed books, which are provided as close to cost as possible and from which he does not receive any royalties. You can read more about why Belsebuub’s work is free here: www.belsebuub.com/about/why-all-this-is-free. Lara Atwood had a number of spiritual experiences from childhood and in the early 2000s began investigating out-of-body experiences and other spiritual phenomena after discovering techniques taught by Belsebuub. Since then she has spent over 12 years researching esoteric subjects, and today works alongside her husband, Mark Pritchard (Belsebuub), to write books, blogs, and articles on spirituality. She describes herself as a writer, researcher, and practitioner of the ancient religion of the sun, which has been uncovered by Belsebuub, and the evidence for which can be found in many ancient sites and teachings throughout the world and in the very design of the universe itself. Researching and writing alongside Belsebuub, she is co-author of two books The Path of the Spiritual Sun and Return to Source. Both authors write on the website www.belsebuub.com, where Belsebuub provides the esoteric knowledge – gained from his over 25 years of personal experience of the process of transformation – which Lara then combines with her research into science, cosmology, archaeology, and ancient texts. Belsebuub’s published books are available at Amazon.com here, Amazon.co.uk here, Book Depository here and at other retailers around the world depending on where you are located. 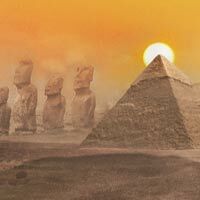 This website explores the ancient religion of the sun that was taken around the world following the catastrophe at the end of the last ice age by the legendary sages and civilizers recorded in world mythology. 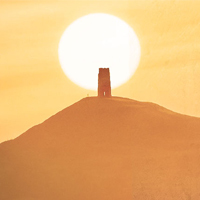 This site aims to rediscover and revive the ancient religion of the sun and aims to help people experience and explore the spirituality of the sun in their own lives. 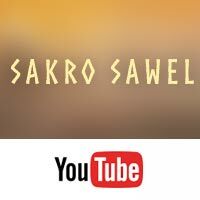 Sakro Sawel means “sacred sun” in Proto-Indo-European. The YouTube Channel and website of the same name is run by Lara Atwood where she shares her research into the Religion of the Sun. 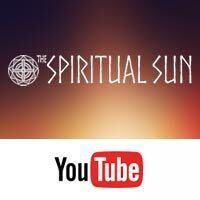 Get the latest video updates from The Spiritual Sun website. Mantras, solstice and equinox ceremonies, events, and everything else to do with the ancient and revived religion of the sun.